A coffin and grave may be one’s final resting place for eternity, but that doesn’t mean it has to be one of deadly silence. 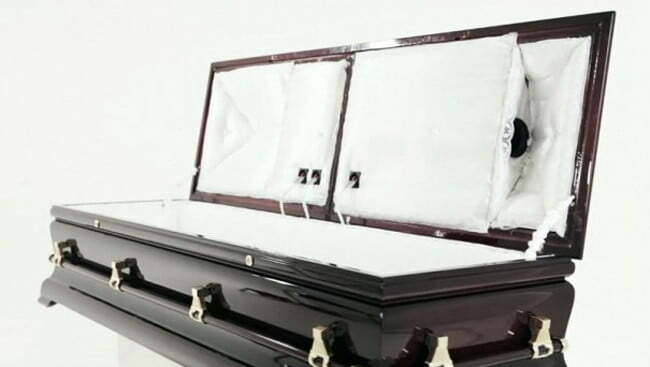 This week we dug up a story about a coffin that included a built-in sound system. While it costs about $30,000, it’s probably the last music system that the dearly departed would ever need. The CataCoffin features a three-speaker Catacombo sound system that might not be loud enough to wake the dead, but it’s still worth trying. This high-tech solution for those who (let’s be honest) won’t really appreciate it involves putting a 2.5Ghz Intel core processor within the so-called CataTomb tombstone. It includes an upgradable music server with a 4G connection that wirelessly delivers the tunes to the CataCoffin six feet under, while a 7-inch display on the tombstone notes what song is currently being played down below. The sound system includes a couple of two-way front speakers with 4-inch midbass drivers and even an 8-inch sub bass element for bass so low, its subterranean. Might as well crank it up; we don’t think there will be any complaints from the neighbors. The CataPlay application provides a link from Spotify to allows users – living users that is – to keep the play list up to date. We’re thinking that this could include covers of the deceased’s favorite songs, or those musical guilty pleasures 0ne wouldn’t want to be caught dead listening to. What’s next? An eternal Netflix account for movie buffs?